Eve Harker is a remarkably talented healer/creator who, with her husband Brian, also a remarkable artist, own and operate Luna Datura's Curious Gifts downstairs from Zombie Logic Press. Here she writes about battling the beast, depression. 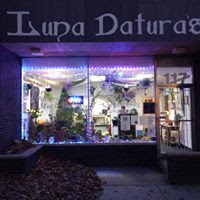 Today is the one year anniversary of Luna Datura's Curious Gifts. It falls upon you like a soft down comforter. It hides behind the illusion of safety and security. It descends gradually like a light snowfall. Gentle flakes drifting down and in their wake leaving a cold sensation. All at once, where no sleep was to be had – too much sleep seems to be the standard. A gray light falls over everything. Why not cry for it?